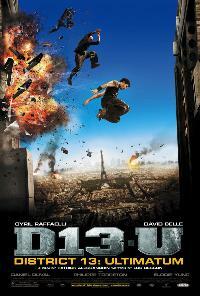 *In 2006, District B-13 arrived from France riding a wave of well-deserved critical acclaim. So excuse me for anticipating more of the same from this eagerly-anticipated sequel, especially since it was based on another script by Luc Besson and because co-stars David Belle and Cyril Raffaelli would both be reprising their roles. However, Morel, who proved that District B-13 was no fluke when he followed it up with the equally-riveting Taken, was not signed to shoot the sequel. Instead, he was replaced here by Patrick Allesandrin who may have four prior feature films under his belt, but none in the high-impact thriller genre. And it shows. Is District 13: Ultimatum bad? Not by a long shot. Just disappointing, if you’re expecting this adventure to measure up to the original.